Somewhere along the line, Tharaldson Cos. sold the Ho property to one of Harrah's many subsidiary companies. 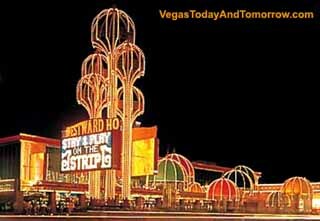 Harrah's also snatched the thin 8 acre property between Boyd's Stardust and the Ho. Harrah's then offered the 24 contiguous acres to Boyd in exchange for the coveted Barbary Coast. Boyd accepted the offer which gives them 87 acres on which to develop their $4-billion Echelon Place. News 6/21/06: Centex sell Ho to Tharaldson Cos. The new owners have new plans for the site. A $1.8 billion mixed-use resort tentatively set to include 1,000 condominium-hotel units, 600 residential condominiums, a 600-room hotel, an 80,000-square-foot casino and 200,000 square feet of retail. This may still be the site for the Voyager wheel. Tharaldson would not comment on this. Details are pending. The Westward Ho has been demolished and the site is being cleared. Only the ugly umbrella structures on the strip remain. 11/17/05 5:00 PM Centex, the Ho's new owners, closed the property with hopes of redeveloping the property. The Westward Ho, home of the infamous $1.00 Giant Ho-Dog (hot dog), 25-cent coffee, and $1.00 margaritas, closes its doors forever.